If you haven’t heard of the Comikaze Expo happening in LA in November we have one thing to say to you: Stop playing that Dreamcast and get with the programme!! It’s got the big guests, gaming tournaments, it’s all about pop culture with an emphasis on horror, anime, sci-fi, comics and fantasy to name but a few, it’s epically inexpensive and it’s run by some lovely people. We got a chance to sit down with one of those lovely people this week, Regina Carpinelli, Co-Founder of the con and we get to talk Stan Lee, planning a con and we geek out a little about Magic: The Gathering. A little. How did the idea come about? What made you decide to start your own con? I grew up going to San Diego Comic-Con (SDCC). I went every year since I was 12 and I am now 29 and I LOVE San Diego Comic-Con. Like, LOVE IT. It changed my life, but one year I couldn’t get tickets and it was a major bummer for me. So, I heard about a smaller, local convention and checked it out. I won’t name names, but said convention cost me and my baby brother around $70 after parking. I got in the show and it was ho-hum at best: no vendors, no good programing. To make matters worse, I only had $100 cash left on me, so I couldn’t do the shopping I wanted to. That moment I said to myself, “Hey you grew up in events and promotions, why not make something cool and affordable yourself. No one can get in to SDCC anymore, and these other shows are ripping people off” That night, like a good little nerd, I ran some numbers and found out that you can put on a show for a killer price and still keep the integrity of a killer show. There was nothing like SDCC in LA at all, so at that moment, Comikaze Expo was born. From there, it grew into this awesome event and now we are on par with the other larger Cons in the USA. We can claim to be the most affordable show of its size in America. We also run our show a lot differently than most conventions. We keep it ALL local: we use local business’ to print with and only use LA-based companies to build the expo hall. I wanted to make it all about LA and the local geek community. We are really into supporting local business and creators. Most shows do not do that. We run a full circle of being great for the public as well as the economic side of things. What sets Comikaze Expo apart from the other conventions? For one the prices. Our tickets are only $12, that’s so unheard of. But also we are really grassroots. All of our marketing and social media is really interactive. We like to create relationships with our fans. Larger companies can’t really do that. I also wanted Comikaze to be a place where new creators can showcase their stuff, a lot of the indie stuff gets swallowed up at SDCC; Comikaze is where they can shine. We are all about supporting and promoting everyone, you can have written for DC or your first-ever comic and we are going to push you the same. We want to keep a community vibe to our show. This show is all about being creative, being positive, and inspiring people. I want kids leaving the show and saying they want to be artists or writers because they met someone like Stan Lee or Chris Hatings, or even because they met a new creator like Lauren Pottinger or Bailee Desrocher from PMS Comics, or the guys from Zombie Outlaw, or Vigilante Project! What can people expect from Comikaze? This convention has everything a Pop Culture Monster could want. We’ve made a delicious nerd pie and each slice is chock-full of the cream of the Comic Book, Horror, Anime, Gaming, Sci-Fi, and Fantasy crop. Stan Lee will be there with some SPECIAL announcements. Comikaze will be Elvira’s Last Appearance. The creator of Invader Zim, Jhonen Vasquez, is coming out of hiding. We have Star Trek stars, an All That reunion, Special FX legends, Tattoos by famous tattoo artists, DC comics and their New 52 presence, amazing vendors and killer programing. Plus, it’s $12. You cannot go wrong with our price and what we’ve got going on. What’s Stan Lee’s special announcement? Go on, you can tell us. We’re friends, right? He is making a Dazzler Movie with Lady Gaga? Didn’t you see our Commercial? LOL. Just kidding, you gotta wait . We are friends but I signed a NDA, so MY LIPS ARE SEALED. You were very focused on getting people’s input insofar as what they’d like to see at Comikaze. What made you decide to take this approach? We love input. I personally love a lot of nerd things. But I wanted to hear from the people. I always say “We are not Communist, but we are for the people BY the people.” I think it’s important to listen to your fans. So many conventions are horrible. They’re run by faceless corporations or people who are so biased that they don’t think about what the wants of the general public are. At Comikaze Expo, we listen and we will continue to listen. Our show is 100% for our fans. As we get bigger and bigger we will be able to make more requests happen. Comikaze Expo is a totally different show then all the others! AMAZING! We have the best fans and supporters. They see our positive attitude and that we are trying to do something unique to reach all demographics. The average mid-level convention in America is about $25-$35 for admission alone. We actually made a huge end show that’s only $12 and kids under 12 are free. People like that they can come to a consumer show and actually consume. Times are tough, but awesome can still be affordable! Already our ticket sales are insane! It’s great because we have such a fantastic show. People will be leaving HAPPY! What guests are you most excited to see? My nerd personality is all over our guest list. I am super excited to have Elvira. She’s one of my heroes. Jhonen Vasquez is MIND blowing, as it’s such an honor that he left his cave to come hang out with us. I also can’t wait to get my New 52s signed! I know it sounds lame but I love pretty much every aspect of my show. I grew up watching All That and to see those kids now is gonna be AWESOME! I am not gonna lie… I have a lot of personal art I want to buy from our artists, and items I want signed from many of our actors!! What kind of topics will be on the books for the panels at this year’s convention? So many! Everything from Q&As for all sorts of topics with Celebrities, Artists, and Writers to Workshops, Screenings and New Releases. We have it ALL! We also have some great gaming tournaments. OLD-SCHOOL NINTENDO! Yes, I said OLD-SCHOOL NINTENDO! Magic: The Gathering, Yu-Gi-Oh… We are also one of the largest Warhammer 40k tournaments on the West Coast! We even have a gaming station where you can learn to play a game or chill out and just play some video games! Will there be Cosplayers at Comikaze? I love everything. But I am a MAJOR, MAJOR fan of Magic: the Gathering. If I wasn’t so busy with Comikaze Expo, I would be trying to get on the pro tour. Magic is a major part of my life. It’s such a smart game, and so much fun. I think everyone should play it. A lot of our guests have become personal friends. I literally taught Lisa Foiles (All That, and writer for Kotaku) and Bailee DesRocher (PMS Comics) how to play. We have ladies MTG and happy hour whenever we can. I am also a HUGE Doctor Who fan. And, of course, I like horror, comics, and video games like all my other fellow geeks. But for me the Doctor and Magic are where it’s at. A Magic fan? AWESOME! Us too! I love Magic The Gathering, it’s an amazing game. It is like a drug; a drug that makes you smarter. It really helps me in making smart business decisions . I think everyone should be playing magic. We are actually doing some great stuff with MTG and Team Unicorn. Check out our gaming tournaments. We even have MTG artists coming. We also have a new TCG game coming called Geekfight. They made us a Comikaze Expo card. Dreams come true!!! What’s your favourite deck build? Last night I actually made a really cool agro White Human deck with my brother and fellow MTG junky Fabiano. I call it MANAfest DESTINY (Yeah, I do fun names for my decks) It moves so fast and has a pretty good chance with those jerkface blue black control decks. It puts out so many heavy hitters by turn 3 it’s amazing. Turn 1: I will always drop either Champion of the Parish, Lawkeeper, or Doomed Traveler. Turn 2: Doomed Traveler or Gideon’s Lawkeeper, if I put out Champion turn 1 I am now hitting my opponent for 2. Turn 3: Honor of the Pure. Now I’m hitting them for 3/3 and 2/2. Turn 4: Mirran Crusader , who is now a 3/3 double strike and my Champion is now a 4/4. Turn 5: Angelic Destiny equipping this to Mirran Crusader, who is now a 7/7 double strike with Flying and another Doomed Traveler. Now I have you in a corner. If you try anything funny, I will throw down Day of Judgment or hit you with an Oblivion Ring. Turn 6: HERE COMES GIDEON, or my Sun Titan. At this point Doomed Traveler has most likely become a little flying ghost. Turn 7: if you are still alive I will then ruin your life by equipping Angelic Destiny to my Sun Titan. TAKE THAT!! Innistrad is SOOO cool! Best series EVER. Everything about it is amazing. These are my favourites in no particular order. 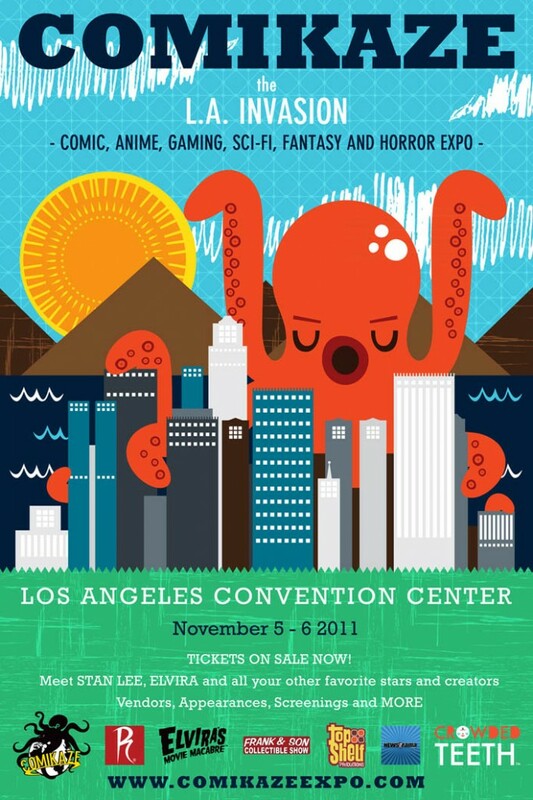 Check out Comikaze Expo’s website for more details and, of course, follow them on Twitter @ComikazeExpo.